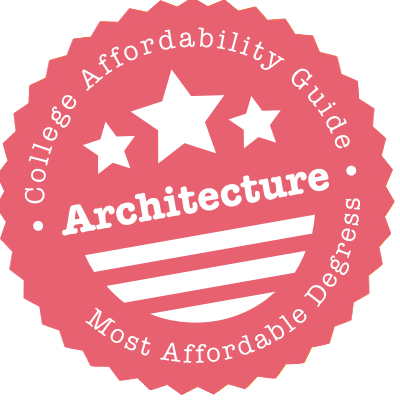 Scroll down to see the most affordable architecture degrees, as well as info on the different types of architecture degrees and architecture program accreditation. The College of Architecture at Texas A&M-College Station offers two tracks in the Bachelor of Environmental Design program, a pre-professional design study track or the research study track, which culminates in a written thesis. The design track prepares students to enter the school's Master of Architecture program, accredited by the National Architectural Accrediting Board. All undergraduates are required to take part in a semester away program, either studying abroad or completing an internship in the field. Graduate certificates allow students to further specialize in the field. Scholarships offered include the August A. Neuner Scholarship, Arthur W. Licht Memorial Scholarship, or a variety of scholarships offered by chapters of the American Institute of Architects (awards vary). The School of Arts and Architecture at UCLA offers hands-on experience and cross-discipline collaboration in design and urban planning through its cityLAB, Experiential Technologies Center and The Now Institute. Junior-level students are eligible for the two-year bachelor's degree leading to the Master of Architecture. The professional master's program is accredited by the National Architectural Accrediting Board and offers the opportunity to complete coursework in urban planning. Research and theoretical studies are the focus of the Masters of Arts and doctoral programs. Financial aid includes scholarships, teaching assistantships, research awards, need-based awards and work-study. Graduate students are considered for competitively awarded recruitment fellowships worth about $23,000 annually. The University of Illinois-Chicago School of Architecture draws inspiration from the diverse architecture of the unique city, helping students understand the history found there and envision a new future. Foundations are laid in the Bachelor's of Architecture program for technical confidence and development of an aesthetic. Students also gain a practical education through a network of professional offices. The Master of Architecture degree leads to professional licensing and is accredited by the National Architectural Accrediting Board while a Master of Science builds on those professional skills in a studio-centered course. Scholarships include the American Society of Heating, Refrigerating and Air-Conditioning Engineers (up to $10,000), the American Concrete Institute ($3,000) and the American Council of Engineering Committees ProNet Scholarship ($5,000). The University of Minnesota-Twin Cities School of Architecture prepares students for the role of design professionals with traditional architecture preparation degrees and the unique Bachelor of Design in Architecture. This degree option offers a foundation in architectural principles with other areas of focus. The Bachelor of Science in Architecture prepares students to continue to the Master of Architecture, accredited by the National Architectural Accrediting Board and leading to a professional license. The school collaborates with research centers and practice communities to offer students the chance to explore community outreach, sustainability and preservation. Concurrent degree options are also available. The school offers continuing students scholarships, totaling about $165,000, as well as assistanships for graduate students. The University of California-Berkeley encourages an environment of innovation and collaboration through unique research centers and hands-on learning opportunities in its College of Environmental Design. Offering undergraduate degrees in architecture, landscape architecture, sustainable environmental design and urban studies, the college emphasizes the responsible use of resources and conservation of historically and culturally important aspects of a community. Graduate students may pursue a professional Master of Architecture, accredited by the National Architecture Accrediting Board, and be eligible for an architectural license, or an academic degree. Financial aid includes scholarships, such as the Architecture Undergraduate Scholarships ($500 to $5,000), with graduate fellowships also available to those seeking a master's degree. The University of California Davis is the only college within the UC system to offer an accredited bachelor's program in landscape architecture. Freshmen start by majoring in either sustainable environmental design or pre-landscape architecture while they complete lower-level coursework, and they must apply for the upper division major by submitting a portfolio application. About three dozen juniors are accepted into the program each year. The campus chapter of the American Society of Landscape Architects organizes networking and social events. UC Davis also has a Graduate Academic Certificate in Landscape Architecture and Environmental Design. Westfield State University is one of just two public colleges in Massachusetts with a Bachelor of Science in Regional Planning. The degree comes in two concentrations: Environmental Planning and Urban & Social Justice. Students in the former who are looking to make a difference before graduation can join the Environmental Planning Club. Meanwhile, enrollees in the latter concentration who maintain a 3.5 GPA are likely to be considered for the Emilee Dawn Gagnon Memorial Scholarship, which lists "commitment to social justice" as one of its criteria. Appalachian State offers a Bachelor of Science in Building Sciences with a concentration in Architectural Technology and Design. Students who earn the degree are prepared for graduate study in architecture and related fields, such as construction project management, sustainable building design, or architectural engineering. Students in the program must complete 88 credits in the major, including 15 credits in foundation coursework such as math and physics, 27 credits in introductory courses in topics such as construction technology and computer modeling, 35 credits in advanced coursework including four design studios, and 11 credits in electives. As a capstone to the degree, students are required to perform a professional internship. Some classes for this major may be offered online. Arts and sciences come together at the University of Massachusettes-Amherst Department of Architecture. Students may take classes through the five college consortium towards the Bachelor of Fine Arts Architecture. Those focusing on architecture studies will prepare for the Master of Architecture, accredited by the National Architectural Accrediting Board, with a strong foundation in design, technology, and history. Students can participate in an immersive, for-credit semester in sustainable design and building that culminates in the construction of an innovative, high-performance shelter designed by the team. As the only public institution offering a Master of Architecture in New England, students from surrounding states are eligible for reduced tuition. Graduate students also have the opportunity to apply for assistantships or externships. Thaddeus Stevens College of Technology offers a four-semester program leading to an associate degree in architectural technology. Graduates work with clients on the design of buildings and help create specifications for construction projects. Applicants must have at passed two years of high school algebra and have at least a 2.5 high school GPA. Architectural technology students must have a personal computer and are given a list of required supplies. Students who receive the Stevens Grant will be given their tools on the first day of class. The Stevens Grant covers costs that remain after Pell grants, state grants, and other funding has been paid. Architectural tech majors are eligible for the Bryan K. Frantz Scholarship, up to $2,000 annually. The Architecture and Landscape Architecture programs at Iowa State University are part of the College of Design, which requires all undergrads to spend their first year in the Core Design Program before applying for a specific program. Classes are held in a studio environment. The five-year Bachelor of Architecture program prepares students to become a licensed architect. The program is accredited by the National Architectural Accrediting Board. The Bachelor in Landscape Architecture program also takes five years and is accredited by the Landscape Architecture Accreditation Board of the American Society of Landscape Architects. Iowa State also grants master's degrees in both Landscape Architecture and Architecture. The Barbara King Landscape Architecture Scholarship ($2,500) is given annually based on entrepreneurial spirit. Combining nature, art, technology and science, the State University of New York College of Environmental Science and Forestry helps prepare landscape architects to shape outdoor spaces to balance the needs of residents with environmental concerns. Students learn to creatively apply ecological principles and new technology. As part of the experience, all undergraduate students are required to complete a capstone project where they delve into a specific design-related topic. Both the undergraduate and graduate degree programs are accredited by the Landscape Architectural Accreditation Board. ESF Presidential Scholarships ($3,000) and National Scholarships ($8,000) are awarded to outstanding students, and the four-year Haudenosaune Scholar Awards ($5,000 per year) is also available. Children of alumni also qualify for Legacy Scholarships ($250 per semester). The University of Florida School of Architecture offers a Bachelor of Design in Architecture, Master of Architecture programs accredited by the National Architecture Accrediting Board, a Master of Science in Architecture and numerous programs that allow for specialization within the field of architecture and urban planning. The school has CityLab locations in Orlando and Sarasota which use the community as a classroom to study issues surrounding urban growth in ecologically diverse areas and the unique architecture of each city. The Master of Science and doctoral degrees in architecture focuses on history, theory and research in the field. Scholarship opportunities include the Robert L. Outland Women and Minority Scholarship Award and summer internship program ($3,000) and the William L. Proctor Award ($1,000). The Illinois School of Architecture at UIUC offers Bachelor of Science (BS) and Master of Science (MS) degrees in architectural studies. The MS degree is suited for students preparing for an academic career and hones a student's research skills in environmental design. The school also offers a two-year Master of Architecture (M.Arch) program that is accredited by the National Architectural Accreditation Board (NAAB). M.Arch students have the option of enrolling in one of the current joint degree programs: M.Arch/Master of Urban Planning, M.Arch/MBA, M.Arch/MS in Civil Engineering - Construction Management, and M.Arch/MS in Civil Engineering - Structures. The M.Arch+2 program is designed for students with a non-architecture bachelor's degree. There is also a Doctor of Philosophy in Architecture and Landscape Architecture degree available. Hawkeyes who major in Civil Engineering can choose a pre-architecture focus. The College of Engineering funds hundreds of scholarships while also financially supporting students who take unpaid internships or study abroad via the Global Engineering program. Underclassmen get a soft landing, receiving free tutoring in STEM courses. Although Iowa doesn't have an architecture-specific graduate program, undergrads might apply for the fast-track degree program anyway; it allows them to earn their baccalaureate and an MS from the Civil and Environmental Engineering department in just five years. The College of Design at North Carolina State University has degree programs in architecture and in landscape architecture. Students interested in becoming architects begin with a Bachelor of Environmental Design in Architecture, then complete a professional program - an additional year for a Bachelor of Architecture or two years for a Master of Architecture. The department's specialized areas include city design, coastal design, and public interest design. The Landscape Architecture Department has an undergraduate minor and three options for a Master of Landscape Architecture. Architecture students can join campus-based chapters of relevant professional organizations and gain global awareness through specialized study abroad programs, such as a month in Chile studying sustainable design. North Dakota State University has four- and five-year degrees in architecture and landscape architecture. Architecture students earn a pre-professional Bachelor of Architecture in four years or a Master of Architecture in five years. For landscape architects, the program is a four-year Bachelor of Environmental Design, with a Bachelor of Landscape Architecture in five. The department is housed in repurposed buildings in downtown Fargo with studios, computer labs, laser-cutting facilities, and a specialized library. Student clubs include chapters of professional organizations and the Tau Sigma Delta honor society. The department administers more than 20 scholarships and awards, such as the Klai Scholars award, $4,000 for a senior in either major. With Michigan State's Campus as Arboretum program, landscape architecture students are surrounded by a living learning laboratory. MSU offers a Bachelor's Degree in Landscape Architecture and a dual degree option where students can earn their BLA and a Master of Environmental Design. The bachelor program takes four and a half years and the master's program takes five. Study abroad is built into the program, with most Landscape Architecture students participating in the spring semester of their junior year. Students take classes on campus for eight weeks, then complete the courses overseas at a location chosen by the faculty for that term. The university offers generous financial aid for the overseas program. MSU is accredited by the Landscape Architecture Accreditation Board. Students in UNCG's Bachelor of Fine Arts in Interior Architecture program are the sole beneficiaries of 12 departmental awards. Some, such as the Bienenstock Furniture Library Scholarship, are given based on need. Others, such as the Segner Interior Architecture Scholarship, are distributed based on academic results. Students in the MFA in Interior Architecture program are eligible for their own departmental scholarships - five of them. While most merely go toward tuition, money from the Preservation Greensboro Incorporated Fund helps grad students attend conferences on historic preservation. That topic is a strong theme of the department, which also offers a Post-Baccalaureate Certificate in Historic Preservation. The Spitzer School of Architecture at City College of New York grants a bachelor's degree in Architecture as well as master's degrees in Architecture, Urban Landscape Architecture, Urban Design, and Sustainability in the Urban Environment. It is the only public school of architecture in New York City. Undergrads may earn a Bachelor of Science in Architecture in four years or take a fifth year to earn the B.Arch., a professional degree.The B.Arch. program offers a concentration in Architectural History. The Master of Architecture program is a three-year program that combines required classes with electives so students may study areas of interest to them. The Master of Landscape Architecture program also takes three years to complete. West Virginia University's Davis College seeks to find the highest and best use of land. Its Bachelor of Landscape Architecture program emphasizes social, ecological and aesthetic factors to design urban and rural outdoor spaces. The school limits enrollment in the first-year studio to 50 students, with a portfolio assessment required for continued studies past the second year. Students are to demonstrate effective application of design and construction skills to solve unique challenges of different projects, including recreation, conservation and urban development. The program is accredited by the American Society of Landscape Architects and boasts a 100 percent employment rate for graduates. Scholarships include the RGS Scholarship ($1,000), Jack Paules Scholarship ($750) and the Paul Nesselroad Scholarship ($400). The University of North Carolina at Charlotte's College of Arts and Architecture embraces a studio culture and collaborative leaning environment for students pursuing architectural degrees. The school offers a Bachelor of Arts in Architecture, preparing students for the National Architectural Accrediting Board-approved Bachelor of Architecture or Masters of Architecture programs. Students may also pursue a dual master's degree in architecture and urban design or a double architectural master's from UNC Charlotte and Tongji University in Shanghi, China. Scholarships include Shook/Kelley Design Scholarship, School of Architecture Alumni Scholarship, and LS3P College of Architecture Scholarship, as well as a number of scholarships offered by chapters of the American Institute of Architects in North Carolina. Architecture and Architectural Engineering majors work side-by-side at Oklahoma State University as they pursue five-year professional bachelor's degrees. OSU's Architecture program is centered in the design studio, where students use technology to help in design projects. The college has a 40-year record of outstanding achievement in national student design competitions. Architectural Engineering students focus on structural engineering while developing an understanding of the problems faced by architects. The university also offers a five-year professional Bachelor of Landscape Architecture. BLA students can take advantage of study abroad and internship opportunities to broaden their education. All the professional degree programs are nationally accredited. The University of Georgia College of Environment and Design offers bachelor's and master's degrees in landscape architecture, with a focus on design, creativity, and conservation of natural resources and cultural treasures. The studio-based program lets students get their hands in the dirt, working with plants, historic preservation and site design. The Master of Landscape Architecture is accredited by the Landscape Architecture Accreditation Board and the American Society of Landscape Architects. Graduate certificate programs are also offered in specialized areas, such as environmental ethics, historic preservation, and geographic information science. Scholarships offered include the Hubert B. Owens Landscape Architecture Scholarship ($1,000), the Environment and Design Scholarship and Randolph and the Helen Marshall Scholarship (award amounts vary). The University of Idaho College of Art and Architecture offers a well-rounded foundation in all areas of architectural design, planning and construction as students earn a bachelor's degree or the National Architectural Accrediting Board-accredited Master's of Architecture. The college offers seamless bachelor's and master's degree programs in landscape architecture in a region offering rural and urban landscape study. Trans-disciplinary curriculum bundles help prepare students to work in a variety of fields, all with a focus on gaining real-world experience. The transition from undergraduate to graduate-level courses offers students the opportunity to complete professional degrees more quickly. Scholarships include the John H. Callendar Architecture, Columbia Paint, Gifford David Pierce Memorial and H. James Marshall Architecture (award amounts vary). SUNY Delhi offers an Associate of Applied Science in Architectural Technology and a Bachelor of Technology in Architectural Design and Building. The bachelor's degree prepares graduates to work in a design or building firm or to enter a master's program in architecture to earn a professional degree. In the program, students gain drawing and drafting skills, design a variety of residential units, and work directly with clients in group projects. All the instructors in the program are architects, engineers, or construction professionals with real world experience. Program majors have 24/7 access to drafting studios and fully equipped construction laboratories. Students who earn the A.A.S. in Architectural Technology can transfer into the bachelor's program to continue their studies. The University at Buffalo is home to the only school of architecture in the SUNY system, and it has programs for undergraduate and graduate students. The Bachelor of Science in Architecture is a pre-professional program, and students who want a professional degree must earn a Master of Architecture. The Department of Architecture offers the two programs in a 4-plus-2 configuration, meaning students spend four years in the undergraduate program and two in the master's program. For master's candidates who didn't study architecture as undergrads, UB offers a 3.5-year M.Arch. program. The department also grants a Master of Science in Architecture, a nonprofessional degree for students who are interested in research in fields such as historic preservation or situated technology. Both the Bachelor of Architecture (B. Arch.) and the Master of Architecture (M. Arch.) programs offered by the Department of Architecture at Cal Poly Pomona have been accredited by the National Architecture Accrediting Board (NAAB) until 2022. The B. Arch. Program follows a five-year curriculum and covers topics that include architecture theory and history, building technology, sustainability, codes, and professional practice. The focus of the program is on the design laboratory. Lectures are closely coordinated with the required studio sequence to provide students with ample opportunities to demonstrate and integrate classroom knowledge in their design projects. M. Arch. students can select a concentration in either sustainability or historic preservation. The M. Arch. program is designed to be completed in three years. The UT-Austin School of Architecture offers bachelor's degrees in architecture and architectural engineering and master's degrees in architecture, architectural engineering, environmental design, landscape architecture and architectural history and criticism. The Bachelor of Architecture focuses on design and is a pre-professional degree and can be combined with the architectural engineering degree. The five-year bachelor's program and the Master of Architecture are accredited by the National Architectural Accrediting Board. Upper-level students can take part in the Professional Residency Program, a full-time internship where students gain practical experience and expand professional skills. The school offers scholarships to new and continuing students ($500 to $5,000). The Texas Architectural Foundation provides scholarships to all levels of students (awards vary). The Masters in Landscape Architecture program at Rutgers University focuses on the planning and design of build-out conditions, designing for land where a general plan has already determined the density allowed, such as in metropolitan areas where open space is scarce. This skill is in demand in urban areas around the country. Faculty specialties include landscape remediation and ecological studies. Rutgers offers both a professional and post-professional Masters of Landscape Architecture. The Bachelor of Science in Landscape Architecture is also accredited by the American Society of Landscape Architects as a professional program. The school awards many grants and scholarships specifically for landscape architecture students, including the Roy H. DeBoer Travel Prize (about $2,000) for students completing their junior year. Texas University-Arlington has combined its School of Architecture with the School of Urban and Public Affairs, providing a holistic approach to design, architecture and urban planning. The Bachelor of Science in Architecture is a pre-professional program preparing students for the Master of Architecture, accredited by the National Architectural Accrediting Board, or the Master of Landscape Architecture, accredited by the Landscape Architectural Accreditation Board. The curriculum draws from the humanities, arts, and sciences to provide a solid foundation for design aesthetic, structural integrity and cultural impact. Students may take part in internships or service learning opportunities. The school awards Texas Architectural Foundation Scholarships (amount varies), the Dallas Architecture Foundation Scholarships ($2,000) and the United Masonry Contractors Association Scholarship ($2,500). The Bachelor of Science in Design offered at the University of Nebraska Lincoln is considered a pre-architecture program that leads directly to the Master of Architecture (MArch) degree. The MArch program is accredited by the National Architectural Accredited Board (NAAB) and requires an additional two years of study. For students who have a baccalaureate degree in a non-architectural field, a three-year MArch program is available. Qualified MArch students are given the opportunity to pursue dual degree programs in business (MArch/Master of Business Administration) and in regional planning (MArch/Master of Community and Regional Planning). UNL also offers a Master of Science in Architecture degree. This is a 36-credit-hour program designed for students who plan to pursue a career in teaching and research. The University of Texas at San Antonio offers a Bachelor of Science in Architecture degree that prepares students to complete their studies by continuing onto a Master of Architecture professional program. Graduates of the BS in Architecture program can pursue limited architectural practice but may not qualify for full architectural licensure. The university's M.Arch program is designed for students with an undergraduate degree in architecture. It can be completed in two years and is accredited by the National Architectural Accrediting Board (NAAB). There is also an M.Arch program for students with a non-architectural degree, which can be completed in 3.5 years. A Master of Science in Architecture degree is available, with concentrations in historic preservation and in sustainable architecture. The Voiland College of Engineering and Architecture at Washington State University offers a four-year Bachelor of Science in Architectural Studies degree. Students who complete the program can apply to a Master of Architecture program. The university's M.Arch degree is accredited by the National Architectural Accrediting Board (NAAB). The M.Arch program offers three tracks. Track 1 is for students with a BS in Architectural Studies degree from WSU or a professionally accredited program from another university (such as a Bachelor of Architecture degree). Track 2 is for students with a degree in a related field (interior design, landscape architecture, etc.) or architecture degree holders who are looking for more in-depth design experience. Students with a non-architectural undergraduate degree are considered for Track 3. The University of Central Florida offers a Bachelor of Design in Architecture through a 2+2+2 program in cooperation with the Valencia Community College and a Master of Architecture through the University of Florida CityLab in Orlando. The bachelor's program prepares students for careers in construction management and industrial design. UCF offers cooperative learning opportunities and internships, connecting the classroom to real-world applications. Admission to the professional master's program is competitive. The degree offers affordability by beginning the 2+2+2 program at a community college. The Orlando Foundation for Architecture offers a scholarship for students, with internship opportunities also available. The Architectural Engineering degree program at Kansas State University is structured to create engineering professionals who understand technologically advanced building systems and who are able to bring those systems together as an integrated whole. Students who earn a five-year Bachelor's/Master's in Architectural Engineering can work as engineering consultants or as electrical, structural or mechanical designers. Kansas State also offers master's degrees in Architecture, Landscape Architecture, and Interior Architecture and Product Design. The College of Architecture, Planning & Design is nationally accredited and offers five-year professional programs open to high school graduates, transfer students and students who have already earned a degree. Space in these programs is limited and admission is competitive. The Hines College of Architecture at the University of Houston offers an integrated program focusing on design, with programs in architecture, industrial design, and interior architecture. The five-year Bachelor of Architecture degree and Master of Architecture degree are accredited by the National Architecture Accrediting Board. Graduate design/build studios offer the opportunity to work with regional non-profit organizations to solve unique building problems. The Community Design Resource Center has partnered with more than 15 organizations to address issues of affordable housing, urban planning, and civic projects. The school offers a number of scholarships ranging in awards from $500 to $2,000 and a limited number of instructional assistantships are also available to undergraduate and graduate students. The School of Architecture at the University of Utah offers a pre-professional Bachelor of Science in Architectural Studies degree. Upper division coursework includes classes in architectural theory, site and urban design, materials construction, and building technology. Applicants with a bachelor's degree in a non-architecture field are advised to apply to the Master of Architecture (M.Arch) 3+ program. Applicants with a bachelor's degree in an architecture-related field can apply to the M.Arch 2+ program. There is also a Master of Science in Architectural Studies degree available designed for students who want to specialize in a particular area, such as historic preservation, architectural technology, or project delivery. All of the university's graduate degree programs are accredited by the National Architectural Accrediting Board (NAAB). The University of South Florida School of Architecture and Community Design focuses on urban architecture with an emphasis on design and studio courses. It's home to the Florida Center for Community Design and Research, students and faculty work with interdisciplinary teams to find sustainable solutions to community problems, such as neighborhood revitalization and creative use of abandoned developments. The Master of Architecture program is a professional degree accredited by the National Architecture Accrediting Board and is designed for those who have completed pre-professional degrees or non-architectural undergraduate degrees. Scholarship opportunities include the Masonry Contractors Scholarship, H. Dean Rowe, FAIA Scholarship, and Milo Smith Scholarships (award amounts vary). The Bachelor of Science in Design - Architectural Studies degree at Arizona State University is offered through the Herberger Institute for Design and the Arts. In order to continue in the professional degree program, students must pass a degree milestone at the end of their freshman year. The completion of an internship experience is another requirement for the degree. The institute also offers a Master of Architecture (MArch) degree that is accredited by the National Architectural Accrediting Board (NAAB). A two-year, 56-credit MArch program is available for applicants with a four-year degree in architectural studies from ASU or another accredited school. Applicants with an undergraduate degree in a discipline other than architecture will be considered for the three-year, 96-credit MArch program. From sustainable building to historic preservation, the University of Colorado-Denver's College of Architecture and Planning prepares students for a variety of architecture fields with degrees offered in architecture, landscape architecture, urban and regional planning, urban design and historic preservation and advanced degrees in design and planning. Students have the opportunity to put their knowledge to action through designing and building projects for Native American reservations, in developing nations or in conjunction with area non-profit agencies. Documenting the historic buildings in the region is an ongoing project, with internships available. In addition, scholarships are available, such as the $3,000 Alumni Association Graduate Scholarship or the Bixler Scholarship (up to $10,000). Architects have some of the best jobs in the world. They design the buildings, landscapes, ships, and structures upon which we rely. They’re in the vanguard of movements such as sustainability and environmental design, and play an integral part in city planning and community living. Whether it’s a private skyscraper or a public square, the work of architects has the potential to change the world. Sound good? Then the next step is practical advice. In our guide to affordable architecture schools, you’ll learn about your degree choices and why NAAB accreditation matters. We discuss the steps required for state licensure and NCARB certification, plus where you can go for help. What Degree Do I Need to Become a Registered & Licensed Architect? If you’re intent on becoming a licensed architect, you have a variety of choices. All of these options will prepare you for state licensure. However, BArch graduates who wish to teach at the university level may wish to add a master’s degree in education or a similar topic (i.e. not an MArch) in order to buff up their résumé. Both of these options will prepare you to apply for a 2-year or 3-year MArch program. If you’re worried about time and money, a BS or BA in Architectural Studies will usually shorten the time needed to complete your master’s degree. You’ll often see the pre-professional degree + MArch option referred to as the “4+2 plan” (4 years of undergraduate; 2 years of graduate). If you choose to pursue a bachelor’s degree in an area unrelated to architecture, the MArch may take 3 or 4 years to complete. We talk more about other options (e.g. landscape architecture, marine architecture, etc.) in our section on bachelor’s degrees. An associate degree’s in architecture is a 2-year program that is intended to help you earn credits for a bachelor’s degree or prepare you for entry-level careers in drafting and similar architectural fields. Associate’s degrees are widely available through community colleges, universities, and technical schools. A high school diploma or GED is required to apply. It’s important to remember that you cannot become a licensed architect without a BArch or higher. If you’re hoping to transition to a BArch, make sure your associate degree credits will be transferable to the NAAB-accredited program of your choice. Associate of Science (AS) in Architecture: Often includes the same science, technology, and engineering courses covered in the first years of a BS or BArch. A common choice for those interested in a bachelor’s degree. Associate of Applied Science (AAS): Often includes a specialty such as architectural engineering technology, architectural engineering drafting, or a similar field. A common choice for those who wish to go straight into the workforce after graduation. Many associate’s programs focus on the basics of architectural drafting and engineering. Courses often cover computer-aided design (CAD) systems, architectural drawing, building systems, construction, structural conceptions, and graphic techniques. Strong programs will incorporate a fair amount of hands-on experience in laboratories, architectural firms, and building sites. Look for schools that also teach you to execute estimates, approximate budgets, prepare agreements, and present projects to clients. A bachelor’s degree in architecture is a 4-5 year program that is intended to prepare graduates to become architects. You will find them being offered by a variety of colleges, universities, and military academies. A high school diploma or a GED is typically required to apply. As we noted in our section on degree choices, the BArch is the only professional undergraduate degree that will allow you to apply for state licensure as an architect. If you choose to pursue a non-professional bachelor’s degree, you will have to earn a Master of Architecture (MArch) in order to sit for the ARE exam and become a licensed architect. The BArch typically takes 5 years to complete and must include a minimum of 150 semester credit hours in academic coursework in professional studies and electives. Courses will often cover important areas such as architecture theory, project planning, computer-aided design (CAD) systems, urban design, construction methods, mechanical systems (e.g. electricity, plumbing, etc. ), environmental design, project management, and architectural history. You may be asked to prepare estimates, evaluate budgets, and present work to clients. In the final year, many universities ask students to work under the supervision of a licensed architect in a professional firm. This internship is a critical part of preparation for your professional life. Before you enroll in a BArch program, make sure it is accredited by the NAAB! Talk to your academic advisor about your options. For example, if you are interested in becoming a marine architect, you may need a BS NAME, a mariner’s license, and on-the-job training to qualify for jobs. If you are interested in becoming a landscape architect, you may need a BLA or master’s, 1-4 years internship experience, and a state license for landscape architecture. A master’s degree in architecture is a 1-3.5 year graduate program that is intended to prepare students for architectural licensure or provide them with further study in an area of interest. These programs are offered by a wide range of universities. A bachelor’s degree in architecture or a related field (with knowledge of areas such as design theory, CAD systems, and construction technology) is usually required in order to apply. As we discussed in our section on degree choices, you must have a BArch, MArch, or DArch in order to become a licensed architect. But since MArchs come in a variety of flavors, we’ve listed some of the most common options. The MArch I is targeted at students who have earned a bachelor’s degree in a field related to architecture, but who don’t have a massive amount of architectural knowledge or expertise. Because of this, most universities insist that students complete at least 3-3.5 years of concentrated master’s coursework before they are allowed to graduate. You may be expected to study areas such as physics, building science, architectural history and theory, city planning, environmental design, calculus, and structural engineering. A final project or thesis caps off your education. The MArch II is intended for students who have completed a professional, 5-year BArch (or its equivalent) and wish to expand their field of expertise or specialize in a certain area (e.g. sustainability). Because MArch II students are already qualified professionals, they often have a great deal of curriculum choice. For example, in their second year, they may choose to write a thesis, focus on teaching skills, or pursue a special project. Students with a pre-professional undergraduate degree in architectural studies (e.g. a BS or BA) may be interested in investigating a “4+2” plan. If you went to a highly regarded school and have strong undergraduate grades, there are universities that are willing to enroll you in a 2-year MArch program. Although this path takes one year longer than the BArch, it gives you the chance to explore more areas of architecture in your bachelor years and pick a master’s program & thesis topic that suits your exact area of interest. This degree sometimes fall under the larger heading of the MArch I. Post-professional master’s degrees are typically aimed at architects who are interested in focusing on research and preparing for a Doctor of Philosophy in Architecture. A doctorate in architecture is a 4-7 year graduate program intended for architects who wish to teach at the university level, pursue high-level research jobs, or improve their career opportunities. In most cases, you must have a master’s degree or the equivalent in order to apply. This is the traditional pathway for architects interested in research and academic careers. PhD students are expected to contribute an original piece of research to the field of architecture and complete a research project or dissertation. Like the BArch and the MArch, the Doctor of Architecture (DArch) is an NAAB-accredited professional program that allows architects to apply for state licensure. In your search for doctoral programs, you may find that DArch degrees tend to have a more practical/professional focus than research-oriented PhDs. A certificate in architecture is a non-degree, academic program that takes approximately 6 months-1 year to complete. Architects may pursue certificates in order to fulfill continuing education credits, earn course credits for a degree, specialize in a field, start their own firm, and/or hone their skills. In the past few decades, online programs have become popular with working professionals. Undergraduate certificates are intended to give students an introduction to the field or teach them essential skills. Graduate certificates are aimed at working professionals who already hold a bachelor’s degree. Certificate topics can range from interior design, construction, and technology to professional leadership, project development, and enterprise architecture – the options are endless. If you’re interested in earning a certificate in order to prepare for a MArch or master’s degree, make sure your certificate credits will be recognized by your favored graduate program. One thing to note – a certificate in architecture is different from professional certification. Certificates are academic qualifications; certifications are granted by the NCARB and other bodies as a recognition of your professional expertise. No matter which degree program you choose, we recommend you attend a regionally accredited college or university. Regional accreditation is a “seal of approval” granted to institutions by one of 6 regional accrediting bodies (e.g. Southern Association of Colleges and Schools). Remember that regional accreditation is given to the overall institution. To see if the architecture program is accredited for professional licensing, look for NAAB accreditation as well. The National Architectural Accrediting Board (NAAB) is the sole agency that accredits U.S. professional degree programs in architecture. As such, it accredits BArch, MArch, and DArch programs. If you wish to become a licensed architect, you will find that most state registration boards will require you to earn a degree from an NAAB-accredited program. An NAAB-accredited degree will also look great on your résumé when you apply for architecture jobs. Find an NAAB-accredited professional program. Exact licensure requirements vary from state to state, so please check with your state architectural registration board for precise details. For example, some states may allow candidates to substitute work experience for an accredited degree. This means a non-NAAB-accredited program could meet educational requirements. It’s always best to double-check. You can also learn more about the process of becoming an architect on the website of the National Council of Architectural Registration Boards (NCARB). Once you have earned your state license, you may wish to earn a certification from the National Council of Architectural Registration Boards (NCARB). Certification signals that you have met the highest professional standards in architecture, including the protection of the health, safety, and welfare of the public. This is purely voluntary step – architects do not need to have NCARB certification in order to practice. However, NCARB certification can help to speed the process of reciprocity. In other words, you may find it easier to offer your professional services to another state or jurisdiction after you’ve earned your initial license.